Partnered in the enterprise along with Fred Garms were Paul Kleinstein and Jack Carmelo. Kleinstein was particularly active in both the operation of the ride and in the fabrication of the stunts, almost all of which were originally engineered in an on-site workshop, rather than purchased off the shelf from Pretzel or other similar providers. Garms and Kleinstein's pride and vision demanded that the thrills and chills in their dark ride be totally different and more dynamic than any which could be seen in the many similar rides at Coney. 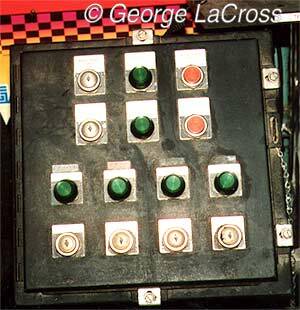 Most of the stunts had fantastic animations and had individually recorded sound bites which were operated from tape cartridge repeaters, a very rare quality to be found in dark rides of that period. Among the ghouls, demons, and damsels in distress, the Frankenstein monster was a very visible inhabitant, appearing two or even three times, probably to capitalize on the popularity of the old Universal movie series which was released into television syndication at around the time Spook-A-Rama opened. 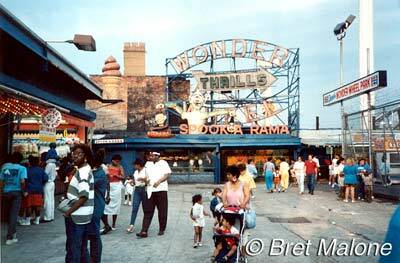 The ride was a great success and operates today as the lone surviving permanently-built dark ride of its era in Coney Island. 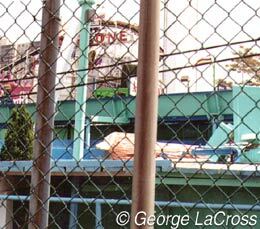 Fred Garms and Paul Kleinstein retired in 1983 and sold both Spook-A-Rama and the Wonder Wheel to Denos Vourderis who, after acquiring the former Ward's Kiddie Park on the adjoining boardwalk, established Deno's Wonder Wheel Park, a family business now operated by his sons Dennis and Steve. Left: Entrance to Building #2 in the late 1950's. Above: The same view today; a canopy shades the entrance to the ride. A shooting gallery has always been located at the right corner. 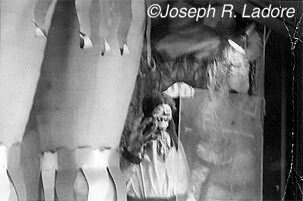 As a young child in the late fifties, the author had the unforgettable experience of seeing Coney Island and Spook-A-Rama for the first time, and with a new Brownie camera, took some of the black and white snapshots shown in this article. It was the era not of theme parks, but of black and white TV, rock and roll, and yellow polka-dot bikinis. 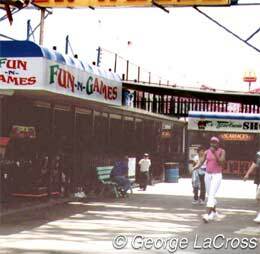 It was a great time and place to be a kid, and it forever solidified my lifelong fascination with this unique and creative form of amusement ride. Left: The courtyard and Feltman building in the late 1950's. A glass-housed figure can be seen in the foreground. Above: The same view today; with the Feltman building long gone, the Cyclone coaster is visible. The same apartment building can be seen at left in both photos. Having seen and ridden my share of 'clip joints' at Coney, I was awe-struck not only by the sheer scope of the Spook-A-Rama operation and the surreal quality of its ride experience, but also by the towering and somewhat lurid exterior decoration. With its enormous murals of skulls, devils and shapely witches painted by an unknown master with an obvious appreciation for female anatomy, gazing upon Spook-A-Rama was to behold the Sistine Chapel of dark ride façades. 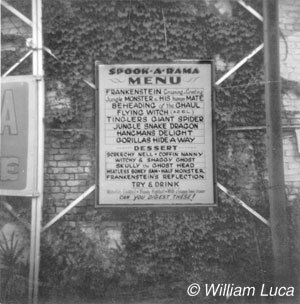 Above: The Spook-A-Rama Menu affixed to the ivy-covered wall of the Feltman building. 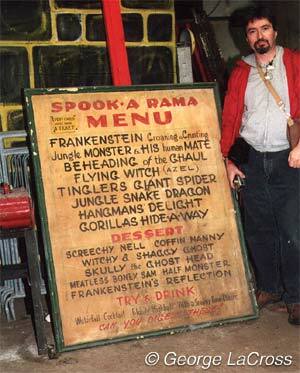 Right: The author re-united with the original menu board in the Spook-A-Rama storage area. 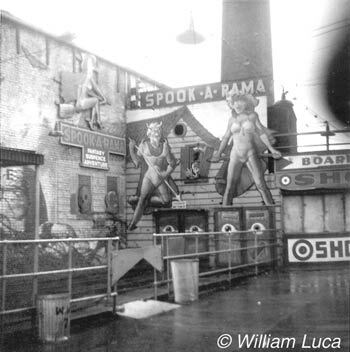 As nothing in life stays the same, so have many changes occured in the almost five decades of Spook-A-Rama's tenure at Coney Island. Among them: the old Feltman building which served as a backdrop to the courtyard was demolished, revealing a view of the neighboring Cyclone coaster, flume ride and the high-rise apartments behind Surf. 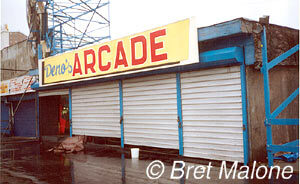 Ave. Building #1 and its waterfall have long since been de-commissioned and converted into an arcade and concessions. Ironically, with Building #1 removed, the ride now assumed for the first time its original configuration as drawn on the blueprints. Loading is now performed at the original Building #2 and the ride no longer makes the winding trek toward the Bowery and back. 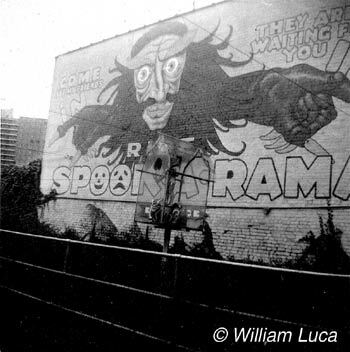 The landscape of Coney Island has always been in a state of continual transition, and as its surroundings changed, Spook-A-Rama's fantastic façade paintings, promising 'Fantasy, Suspense and Adventure', have gradually passed from the scene. 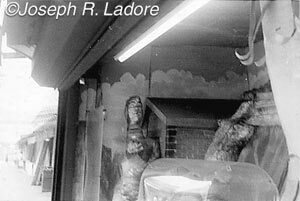 In an ongoing effort to update the exteriors over the years, a series of creepy figures such as space monsters, cyclops, pirates and even Laurel and Hardy have occupied for brief times the rooftops of Spook-A-Rama. In the 1960's, Building #2 began the first in a series of modifications. Here, the Feltman building and its huge chimney have vanished, and a canopy has been placed above the entrance and exit doors. Part of the large background mural survives, but has been painted over with much of its detail obliterated. Large figures on a rotating turntable have been placed atop the landing, and some of the original female-demon illustrated signboards can be seen mounted on scaffolding on the left side of the photo. In 1969, the backdrop mural is now completely gone with only the sign board remaining. 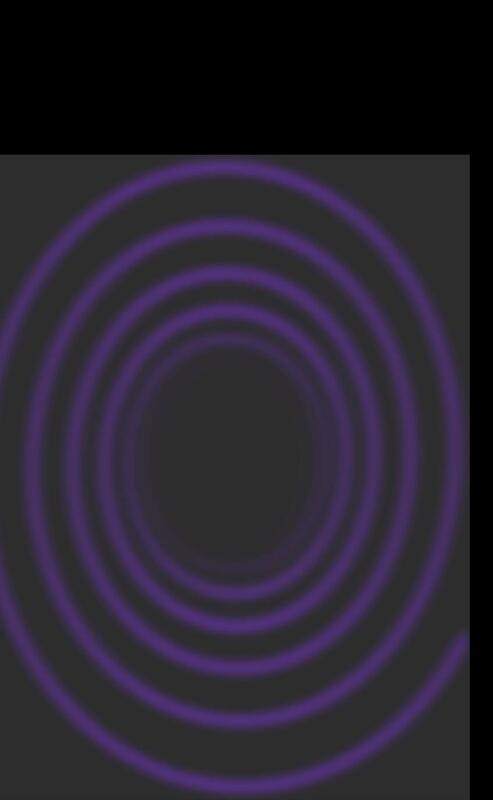 Left: More changes. No traces of the original artwork remain. The Laurel and Hardy figures were obtained from the old Tunnel Of Laffs, at Bowery near Kensington Walk, when it closed. 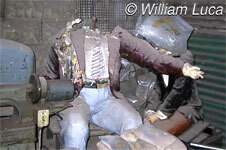 Above: the remains of Laurel and Hardy in the Spook-A-Rama storage area. Deprived of the shelter of their home in Tunnel of Laffs, they were no match for vandalism and the weather. Building #1 in the early sixties from the Bowery. Waterfall area is at left beneath Cyclops. Similar view of Building #1 from the 1980's period. Left: Closer view of Building #1 during early 60's. Many signs give an indication of the nature of the stunts inside. Above: Part of the same building today. Above: Two very rare views of the left and right sides of the waterfall section of Building #1 in 1969. Above left: Track heading out into the courtyard from Building #2 now makes an abrupt U-turn back after loading. 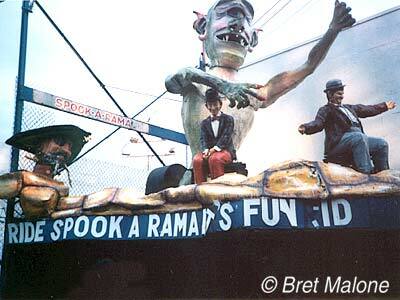 Above right: The Spook-A-Rama ride control panel which was custom-built in house. View of entrance and exit doors. In the foreground is one of the cars purchased from Canobie Lake Park in New Hampshire. At right is the Grim Reaper, from Halloween Productions. 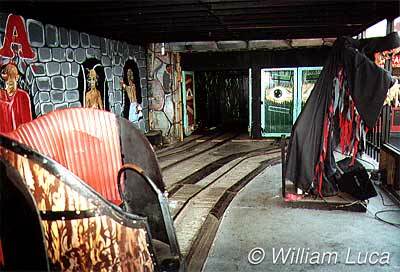 In the background, the eyeball-painted doors are all that remains of the exterior painting from the ride's early days. 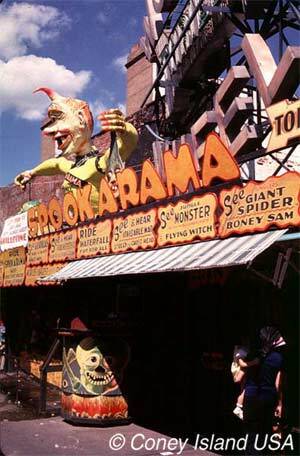 Although many of the original displays have been replaced, either through deterioration or the need to upgrade to current safety codes, Spook-A-Rama has accumulated one of the most eclectic collections of stunts to be found in any dark ride. Some were built on the premises when the ride was new; some are from long-gone manufacturers such as Bill Tracy and Animated Display Creators; others are from newer current studios like Distortions Unlimited, Halloween Productions and Screamers; and many are of unknown origin. 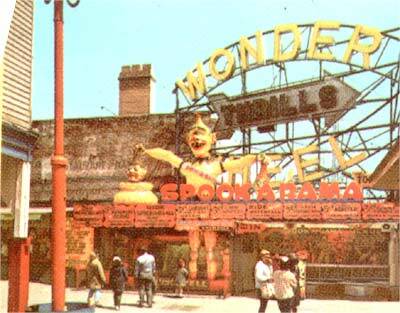 Still others were acquired from neighboring Coney Island rides that had closed, such as Tunnel Of Laffs and Dragon's Cave, as well as the aforementioned 'Hell 'N Back' Tracy-furnished ride at Rockaway. 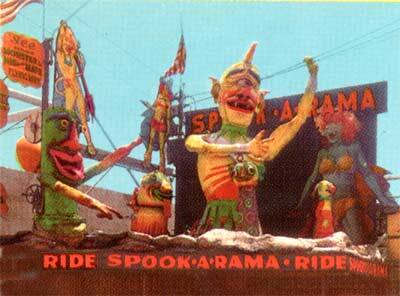 Far fewer than the original 36 cars now comprise the Spook-A-Rama fleet. 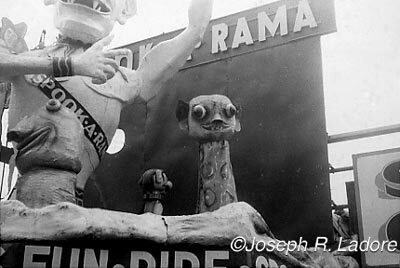 Some of the ride hardware from the Shangrila ride probably made its way to Spook-A-Rama when Steeplechase Park closed in 1964. 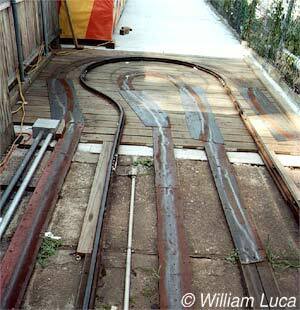 Another set of Pretzel spin cars was obtained from Canobie Lake Park in Salem, NH when that park removed its classic 'Swamp' Pretzel dark ride a few years ago. In light of all that has come and gone, be assured that as a traditional dark ride Spook-A-Rama still delivers the goods. Dennis Vourderis, his family and staff are commited to keeping this great Coney Island classic as full of horrific fun and frenzy as it has always been. A giant, animatronic Grim Reaper guards the entrance, issuing a chilling warning to those who walk by and daring them to ride Spook-A-Rama. Accept his invitation and experience a dizzying voyage through terror, laughter and a true living legend of dark ride history.